Dredd: a nice Segway from the previous story to this new one of Dredd in slavery. This story reintroduces a previous character from an older story and brings out some new ones. It will be interesting to see how these new potential plot threads play out. I am especially interested in the red haired character Nuala. ABC Warriors: I know that the warriors are being set against each other to discredit them and their mission but it is still exciting to see them fight one on one again. Not since the time when Blackblood/Joe Pineapples, Mek-Quake/Mongrol and Hammerstein/Dreadlock have we seen this happen and then it was stopped before it could get really good. Let's see how this plays out. Brass Sun: I'm still finding this more difficult to get into. Perhaps it's because it was so long since the last instalment. Savage: This weeks episode has lots of foreshadowing that bridges Savage to the ABC Warriors storyline. Once again the war has been declared a lie, with the established reasons behind it being revealed to be a cover for those really behind it - just like in Bad Company, the V.C.s and pretty much every war story in 2000AD that has been retconned from it's original run. Did we really need to be told that there are more than one way to see a war? We know that the reasons behind wars starting are not black and white. And speaking of Bad Company...I'm still having trouble that the likes of Thrax and Mad Tommy are alive in this story. I can just about get on board with Flytrap but when I read this I am still wondering if it will be revealed what is happening here. With Bad Company it was presented that Kano and his men were misfits who come together to fight he Krool in their own mad way while the other earther soldiers were more like normal people. But now it seems that no one got out of Ararat without physiological or physical damage. Even on Ararat there were hints that Bad Company were not the only lunatic squads out there - we had the Skull Posse and those poor souls that the Krool had experimented on but in this series it looks like everyone were seriously screwed up. The weather's nae too bad up here at the moment. 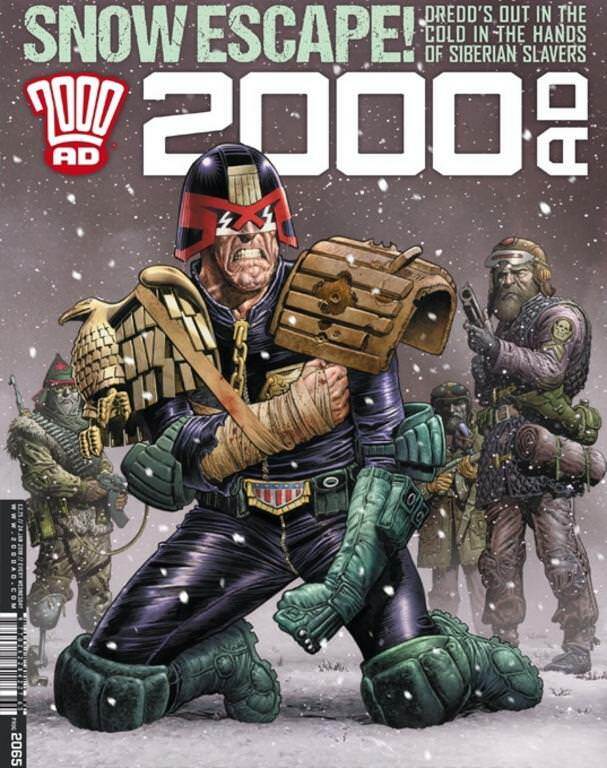 Still, I dae appreciate getting ma 2000AD. Savage: This weeks episode has lots of foreshadowing that bridges Savage to the ABC Warriors storyline. Well the sewage droid does have a cockney accent after all! Anyway back to poor old Porg 2065. I feel sorry for Prog 2065. I mean after last weeks tour-de-force in Prog 2064 and the wonder that was Meg 392 its got a heck of a job on its hands keepin' up the pace. Damnit it gives it a good fist and does its damnest, its a fine Prog, just not quite able to sustain that level alas. On most fronts too. Dredd starts us off nicely as we jump forward to a very good set up Prog and them again to a very exciting bit of Extreme Fishing that would have that fella from Soldier Soldier wishing that he was still with that other fella from Soldier Soldier in a warm TOTP studio. Oh and I love the way Carroll gets around the Dredd keeping on his helmet thing too. Good start, but it is just set up after last weeks fantastic conclusion. ABC Warriors does a good job of showing how much fun a 'talking heads' episode can be, sometimes you are well reminded that Uncle Pat doesn't half know his craft. Brass Sun well its just knocked it out the park last week and it would seem so poor bugger than to catch at 'it' field it, run all the way back just to have it knocked out the park again this week. Supreme. Savage well yes it does play with the old recon vibe and just with the talking heads in ABC Warriors Uncle Pat shows us how to take an old dog and teach it new tricks, its recon done really well. Love the use of the Volganaya (and I'm guessing Ekranonplan but I don't remember that as clearly). Bad Company you know what it might not have quite come together for me yet but taken on its own merits I really enjoyed that episode. Particularly the last page, which indeed is once again the last page on the prog, as in the very last page, the back cover showing how much Tharg is cramming in for us these day, anyway yeah the last page which provides such wonderful old school visuals in glorious modern techni-colour. So yeah while this Prog ain't quite as good as its nearest neighbours, absolute credit to it for staying at the races! Star Wars on your brain at the moment? Sadly, I'm not into this current line-up of stories. Apart from Judge Dredd, I'm finding everything else to be a bit... meh. Even The ABC Warriors isn't grabbing me much. 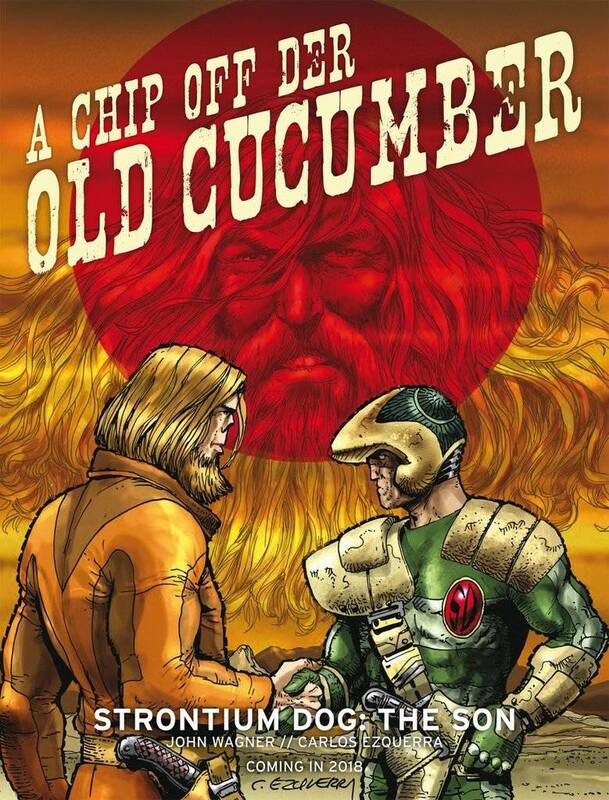 I realise I missed out a lot during my many years away from 2000 AD so there's likely to be a lot that doesn't make sense to me, but having caught up on The Mek Files, I found the earlier stuff to be much more engaging. I'm no fan of Bad Company and Savage and have stopped reading them altogether. After the recent Indigo Prime, Outlier, etc, I'm struggling to stick with the Prog, and if it wasn't for Judge Dredd, I'd have probably stopped buying again by now. Sorry for sounding so downbeat - just wanted to express how I've been feeling about the prog lately. When you're tired of 2000AD, you're tired of life. I think this week we may have been given the answer to why Thrax and the others are still alive -- it isn't really them, they're just imposters, only more convincing than the guy who admits he's an imposter. I don't think there's anything of Bill Savage in either of Hammerstein's or Ro-Jaws's personalities. But I do enjoy the links between the two series. I liked the bit when the guy in Dredd got his head squished. Love the use of the Volganaya (and I'm guessing Ekranonplan but I don't remember that as clearly). Loved that Volgnaya reference, too. Brought back memories of Kevin O'Neill's artwork from those old Ro-Busters "memoir" stories. Ekranoplan might sound familiar because it's the name of a real Russian "plane". I have got a lot of sympathy for this. I returned to 2000AD in 2016 and have sometimes found myself at a loss as to what is happening in a strip. Dredd works because we are all familiar with the basic premis and most stories are short enough to catch from the beginning but other stuff is often very long and quite confusing to readers who weren't there from the beginning. I think it is okay to have one or two strips like this but if the whole prog is this way, as Andy is finding, then it is difficult. One way around this is to look into the collections. I am able to enjoy Brass Sun as I downloaded the free digital version of the first part which I enjoyed enough to make me by the digital collection 'The Wheel Of Worlds'. A Megazine sub is also useful for collecting together earlier strips in the 'floppy's. On the plus side for the prog, I have found Sinister Dexter is friendlier since it is generally short, violent comedy with a distinctive cast. It does give the impression that there is a bigger back story (is there a reason why Dexter's eyes are white and he has a FONY tattoo?) but this doesn't get in the way of me understanding what is going on in these strips. The Thargs 3Thrillers are also more often hits than misses for me, and there have been many thrills that I have been able to catch in their entirety now that I am a subscriber. For those who like physical tomes, the Brass Sun hardcover is a beautiful thing, too. I had been losing the plot with the Prog lately and so re-read all the stories from the Xmas Prog onwards. Now they all make perfect sense. The stand out for me of the current run is Savage which is head and shoulders above everything else. Next up is ABC Warriors . But I can’t help thinking there is a lot of truth in the line that their glory days are long over. Still it’s lovely to look at. I do wish they would move on from the whole Mars story line which seems to have been going on for years if not decades. Brass Sun seems to have gone all Camelot 3000. Which isn’t necessarily a good thing. I think I have worked out another reason why I’m not well disposed to this run of Bad Company - Brett Ewins black and white artwork was just so distinctive and I just think colour doesn’t suit it. The “ghosts” of East Meg One” story line doesn’t feel done to me. They killed all the ghosts. It feels done to me.